September 1 - theme day! Today's Daily Photo Theme is doorways. 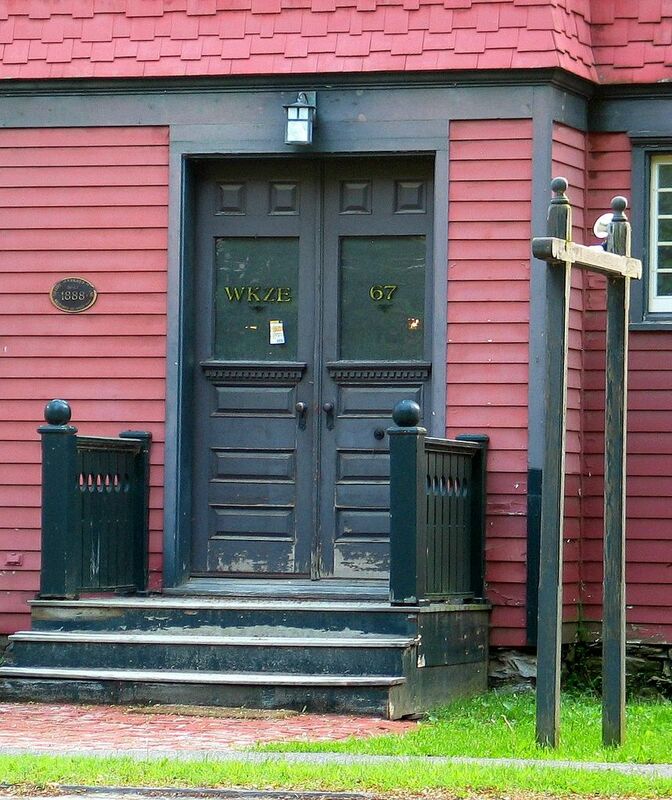 This doorway has sad associations: WKZE, a wonderful independent radio station that played a great mix of acoustic music, was sold and the new owners moved it out of town last year. 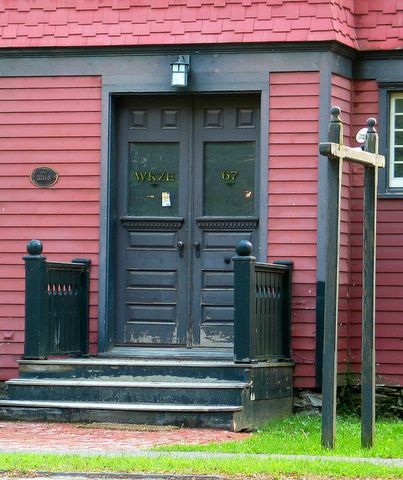 The building has been bought by the town government and there are plans for it, I've heard, but we miss the DJs, and their involvement in local events. We had great pride in our local station! Enter other cities throughout the world through their doorways! Trier/Treves Daily Photo, Trondheim (Norway), Trujillo (Peru), Vallauris (France), Vantaa (Finland), Washington, DC (USA) [Passante], Wellington (New Zealand), Willamette Valley, OR (USA). rise n shine, people...it's WKZE! :) it's a classic looking door. too bad they've moved, eh? perhaps it'll be replaced by another local station? Beautiful colours.. very much like an old cottage. Don't you just hate when good things (like a station) change. A wonderful doorway to share! Are my eyes playing tricks, or is the porch higher than the building? Very colorful building. Sorry you lost your independent radio station. However in general terms I may be part of the problem. Specifically, I only listen to XM radio and rarely find a reason to listen to conventional radio anymore. I'm sure that some might find the colours a bit odd, but I love it! Hope some nice group moves in. This doorway looks so solid, strong and well used. I too like the colours. The worn steps are a statement in themselves, I think!